AT&T has started to roll out an update to some iPhone and iPad users running the latest iOS 12.2 beta 2 update that changes their LTE service icon to “5G E,” short for 5G Evolution. This controversial move from the US carrier comes after it has done the same for some Android smartphones. As spotted by 9to5Mac readers Jay and @Siddavarapu, the change from AT&T started showing up today after updating to the latest iOS 12.2 beta that includes four new Animoji. 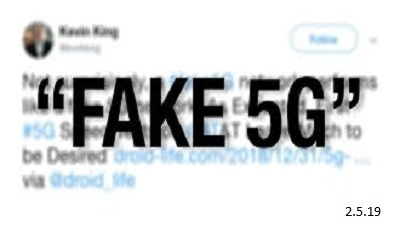 The carrier-based change has received some heat as the carrier isn’t actually offering true 5G service, nor does any iPhone have a 5G modem. It looks like users of the latest iPhones (XR, XS, and XS Max) are seeing the change when running the iOS 12.2 beta 2 software. Meanwhile, we would expect the 5G E icon to be seen on the 2018 iPad Pro models as well since they share the same 4×4 MIMO LTE chips as the new iPhones. AT&T has said that it plans to roll out its true 5G service nationwide by 2020, the same year that Apple is expected to include the necessary 5G modems in its iPhones to take advantage of the next-generation cellular network. The carrier currently has its enhanced 5G E service live in over 400 markets and sees it as an important step in moving to standards-based 5G service. There's more posted on OUR FORUM.